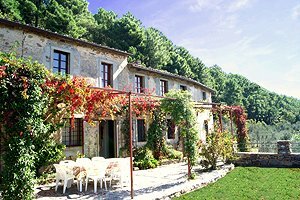 The farmhouse stands in panoramic position on the hills between Pisa and Lucca, near the small medieval village of Buti and just a few kilometres from the famous beaches of Versilia. Olive groves and pinewoods surround the building. Thanks to its hilly position (300 metres above sea level) and proximity to the sea, the house enjoys a particularly pleasant climate throughout the year. 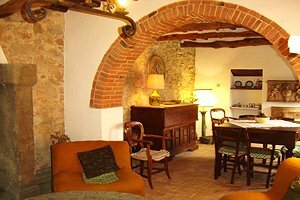 The building, an ancient house dating back to the 17th century, has been renovated and furnished with an eye to preserving the original Tuscan-style architecture and materials. Guests are granted the utmost privacy. 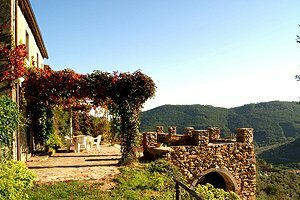 At the same time, the most important Tuscan cities of art (including Pisa, Lucca, San Gimignano, Volterra, Florence and Siena) are within easy car reach for pleasant one-day trips. A wide and shady panoramic terrace on the front of the house is furnished with table and chairs for having meals al fresco. 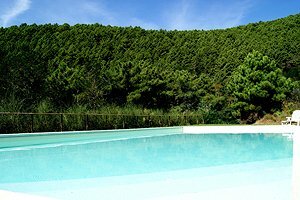 In the wide green lawn next to the farmhouse lies a private swimming pool (14 x 5.5 x 1.5 m), for guests to relax. 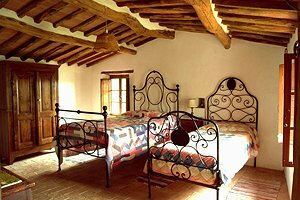 The farmhouse covers a surface of about 180 square metres and offers 8 sleeping accommodations in 2 double-bedded rooms, 2 twin-bedded rooms and 4 bathrooms. 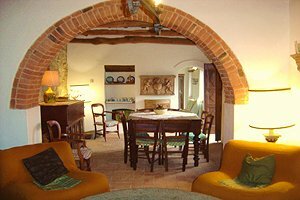 On the ground floor are a large fully equipped kitchen (provided with dishwasher, washing machine, freezer, electric and microwave oven), a wide dining room, a bright living room with an ancient fireplace and a bedroom with an ensuite bathroom. 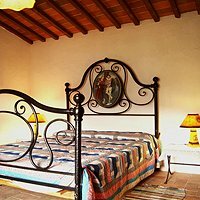 The first floor composes of two large independent double-bedded rooms with wrought-iron beds, one twin-bedded room with an ensuite bathroom, one bathroom with bathtub and one bathroom with shower. The house features a garden and is provided with washing machine, dishwasher, car park, swimming pool and Internet connection. 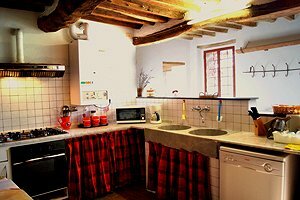 Restaurants, post office, banks, chemists, first aid and other shops and services are in the ancient village of Buti, 1.5 kilometres from the farmhouse. 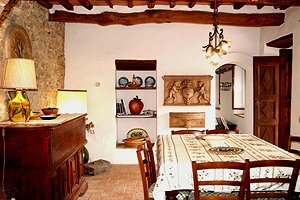 The nearest beaches are in Marina di Pisa and Tirrenia, 20 kilometres from the farmhouse. The beaches of Versilia are 40 kilometres from the farmhouse. Buti (the nearest village) 1.5 km - Lucca 20 km - Pisa airport 20 km - Florence airport 60 km - Siena 186 km. 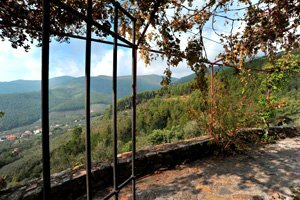 The farmhouse stands in panoramic and sunny position about 1.5 kilometres from the ancient village of Buti. A 700 metres climbing country road leads from Buti to the farmhouse. The road is surfaced only in part. Struttura bellissima caratteristica e fornita di tutto il necessario. Completa il tutto il bellissimo contesto in cui si trova. Ottimo! 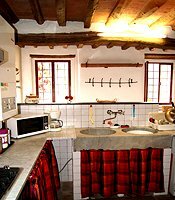 We loved the property - it was just like advertised (a rustic farmhouse) with enough room for our group and a fabulous pool. It was peaceful and private with a gorgeous view. 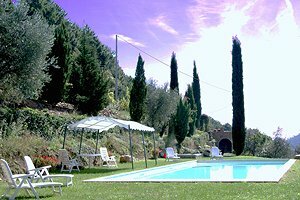 The location was ideal, enabling us to make day trips to Pusa, Lucca and Florence. 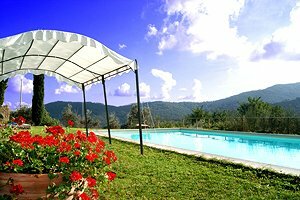 Beautiful villa in an isolated location in the hills of Tuscany. All amenities. Very helpful and friendly owner. Situated up a steep and narrow road/farm track but worth the effort. Will definitely use again.